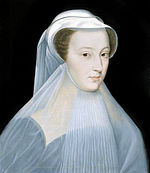 Mary, Queen of Scots, in deuil blanc c. 1559 following the deaths of her father-in-law, mother, and first husband Francis II of France. The colour of deepest mourning among medieval European queens was white. In 1393, Parisians were treated to the unusual spectacle of a royal funeral carried out in white, for Leo V, King of Armenia, who died in exile. This royal tradition survived in Spain until the end of the fifteenth century. In 1993, it was revived by the Spanish-born Queen Fabiola for the funeral of her husband, King Baudouin I of Belgium. Additionally, in 2004, the four daughters of Queen Juliana of the Netherlands all wore white to their mother’s funeral. The custom for the Queens of France to wear deuil blanc [white mourning] was the origin of the White Wardrobe created in 1938 by Norman Hartnell for Queen Elizabeth (later the Queen Mother). She was required to make a State visit to France while in mourning for her mother. White is associated with spirituality, truth and above all Purity. So, it is somewhat related to all sacred things. Hence all wear white to show respect for the departed on the occasion. Hindus believe that after a person is dead his soul is at peace and is free from all material and worldly desires. so to represent this idea Hindus wear white to funerals. BUT , please note that it is not just Hindus that wear White. As part of the common culture in the Indian subcontinent, people from Most Religions wear white to show respect at funerals or other ceremonies. This entry was posted in celebration singing, classical singing, funeral singing, Singing for Special Occasions and tagged funeral, funeral service, funeral singer, funeral singers, wearing white, white mourning. Bookmark the permalink. Are you looking for a beautiful religious hymn for your church wedding?